With the new character that was introduced in the previous issue at the end of the intense climax, we see more of the story behind how and why Ollie came to be on the island. There was a purpose behind it all. He was to be trained for a very specific role in the future. And the demand for that role is now here. Ollie now has to force himself to relearn certain truths, and become conversant with a very dark piece of history that he no knowledge about before this very moment. His character drama is one of the best things about this comic. 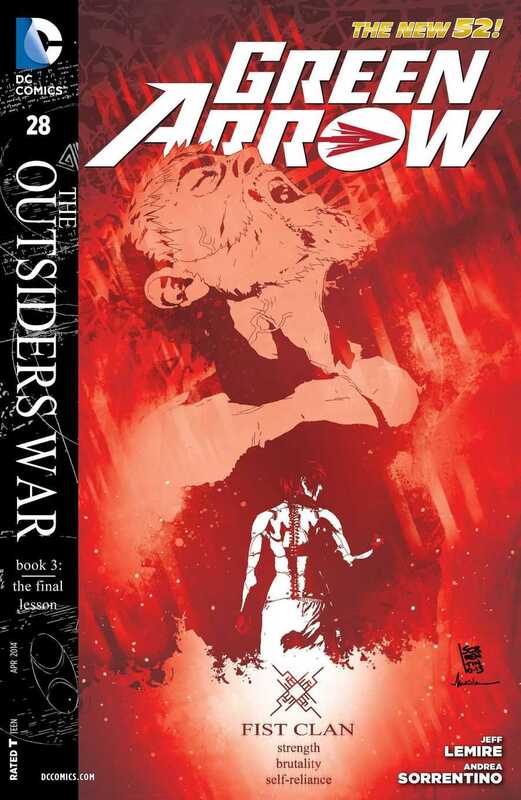 For a relatively new reader to the Green Arrow comics, this issue delves into a lot of the backhistory of the Outsiders clans, how they are run, who their allies and what their eventual goal is. Possibly. But we also see how the Outsiders have been a major part of Oliver’s life without him even realising it. Now that is a great angle to approach here, I think. It gives the scripts a very strong epic feel, and I love epic, so I naturally enjoyed this comic as well. Reading through this issue, I felt really bad for Ollie, given the curveball he got thrown in the previous issue, and the ramifications of this… truth finally coming out. It adds a lot of tension to him as a character and it also casts a shadow on his relationships with the two “good guy” characters that are shown in the scenes on the islands. You can’t really ask for more than that, I don’t think, because there is this certain level of excellence in this comic that I believe is extremely hard to match, in any way. The fun part is in figuring out where Ollie takes things from here, and what his big antagonist Lacroix aka Komodo is planning. The latter is an extremely ruthless character in the series, and this issue takes things quite far in that regard. And given all the different things and subplots that Jeff Lemire touches on here, his pacing is always spot on. Especially when he sets up the splash pages, which Andrea and Marcelo did an incredible job with, by the way. Each subplot gets to shine and then (temporarily) fade, so things are always moving on even as the overall story begins to move into its final phase as Ollie’s war with the Outsiders finally looks set to begin. As for the art. Like I said, Andrea and Marcelo turn out such amazing artwork month after month that it is tough to talk about things in a different way. One thing I want to touch up on though are the layouts. Andrea has shown again and again that he is the man you want when you are looking to do some crazy layouts, and that’s exactly what Andrea does, twice in fact. I love a comic that messes around with perception of the art, and this comic is definitely high on that list. Like very high. All I want to say to the creative team is, keep doing what you are doing because what you are doing is damn good. More Green Arrow: #24, #25, #26, #27. Posted on February 5, 2014, in Comics Reviews, Review Central and tagged Andrea Sorrentino, Archery, Arrow, Comics, Comics Review, DC Comics, Green Arrow, Jeff Lemire, John Diggle, Komodo, Marcelo Maiolo, New 52, Oliver Queen, Review, Review Central, Rob Leigh, Shado, Superheroes, The Outsiders, The Outsiders War. Bookmark the permalink. 5 Comments.